Harry Houdini (March 24, 1874 – October 31, 1926) was a legendary twentieth-century American magician, escape artist, contortionist and showman. Born Erich Weiss in Budapest, Hungary, he immigrated to the U.S. with his parents in 1878. Here’s where his spirit still haunts. "Young Harry always had an interest in magic and performing. Around the age of seventeen he began doing a magic show with his brother Dash called The Brothers Houdini. Harry would spend hours working on magic tricks and practicing quick hand movements." Ducksters delivers a simple biography, perfect for elementary students. Each of these 552 Houdini photographs and promotional posters are annotated, just click on each image to see its details. Some are available to embed on your non-commercial website or blog for free. Just look for the blue embed icon next to the other social sharing networks, and follow the directions. "With each arrival in a new town, Houdini would offer $100 to anyone who provided handcuffs he could not escape, including the local police. He never had to pay the $100. His easy escapes provided excellent publicity for his shows and he quickly became a headliner, playing in large cities across the country." 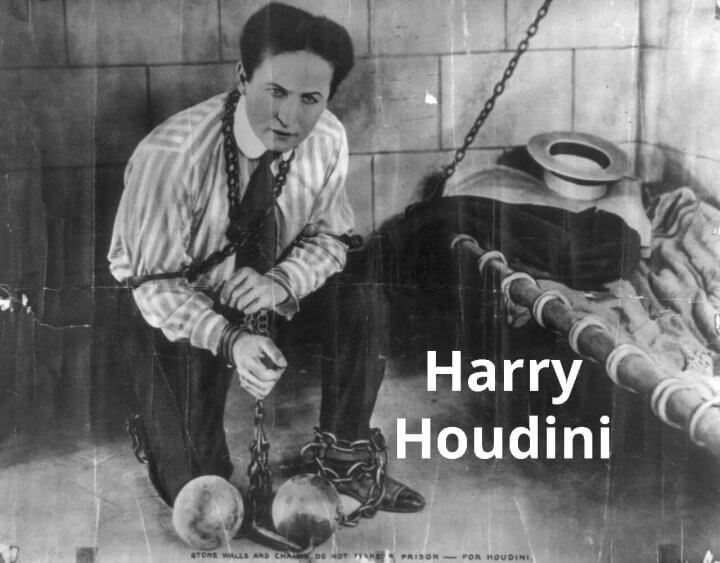 Visit this fan site for a biography, and details about Houdini's career and death. "Master escape artist Harry Houdini died on Halloween of 1926 from a ruptured appendix, but many of the circumstances surrounding his demise remain mysterious to this day." History unveils conflicting details about how Houdini actually died. "In 1899 Houdini received his big break when vaudeville impresario Martin Beck saw his act at the Palmgarden beer hall in St. Paul, Minnesota and booked him in his national Keith-Orpheum circuit." This Houdini fan site is published by John Cox, and is my pick of the week! Cox's fascination with Houdini began as a teen (in 1975) when Cox began practicing escape and performance magic. Feldman, Barbara. "Harry Houdini." Surfnetkids. Feldman Publishing. 18 Sep. 2018. Web. 20 Apr. 2019. <https://www.surfnetkids.com/resources/harry-houdini/ >. By Barbara J. Feldman. Originally published September 18, 2018. Last modified September 18, 2018.